Offering you a complete choice of products which include semi automatic volumetric liquid filling machine, volumetric liquid bottle filling machine, bottles liquid filling machine, monoblock volumetric liquid filling machine, pesticides liquid filling machine and shampoo filling machine. These Semi Automatic Volumetric Liquid Filling Machines are manufactured from high grade quality material and are easily available at very reasonable price in market. 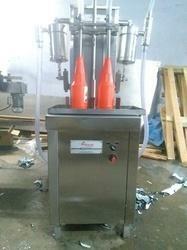 These machines are suitable for round or flat shape bottles or vials. Our machines have output of maximum 20 Products per minute depending on nature of liquids, neck diameter or vial/bottle and fill volume. Our firm holds expertise in offering a top-class gamut of Automatic Volumetric Liquid Bottle Filling. 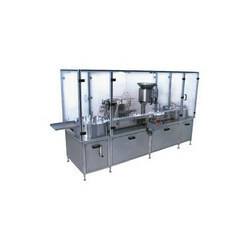 Thevolumetric liquid filling machines offered by us are manufactured using high-grade material using latest technology. Our machines are find application in filling various kind of liquid like sauces, beverages, juices, shampoo and cosmetic creams. These machines are appreciated for their reliability & durability and are strictly tested to meet the international quality standards. Power Characteristics: Single Phase / III Phase with A.C. Frequency drive. ü Automatic speed control system. ü No Bottle - No Filling systems. ü Special Type Diving Nozzle to prevent against foaming problems. ü Nozzle Lock system to dropping problems. ü Automatic sensor based bottle counter system. ü Bottle stopper and holder pneumatic based. ü $.3. Elegantly matt finished body. ü Self lubricating UHMW-PE guide profile for SS slat chain provides low friction wear surface, smooth and noiseless conveying. Filling Volume : 250ml to 500ml. Client satisfaction is our prime motive, keeping this in mind we always deliver quality products at very reasonable price. 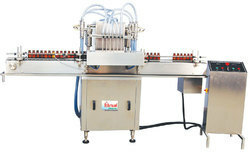 We specialize in offering our customers a top-of-the-line gamut of Bottles liquid filling machine. These machines have an output of 4-head: 60-80 bottles/minute, 6-head: 120 bottles/minute & 8-head: 160 bottles/minute on the basis ofnature of liquids, bottle height, bottle diameter, bottle neck size and fill volume. We are involved in offering our clients an array of Monoblock Volumetric Liquid Filling Machine. 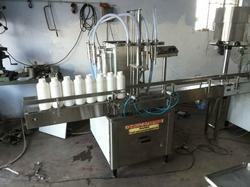 These machines are highly suitable for round, flat or oval shape bottles. Our machines have an output of 220 bottles per minute depending on the type of liquid, fill volume and bottle neck size. These are available at very reasonable price. Our machine is specially designed for Pesticides‘Foaming’ type material. We will provide syringes with N.R.V. nozzle up-down system against your foaming type material & stop dropping problem. No Bottle - No Filling systems. Synchronized two nos. A.C. frequency drive for main motor & conveyor belt for speed control. $.3. Elegantly matt finished body. Adjustable conveyor height as per customer requirement. 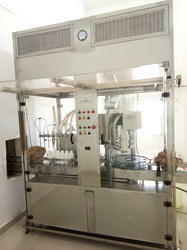 Our company is involved in manufacturing and trading Shampoo Filling Machine that is provided at reasonable rates. The proffered selection comes with built in A.C. variable frequency drive system for speed control. Furthermore, the series comprises of specifically designed diving nozzle system for preventing foaming problems. We manufacture these machines from high grade quality material using latest technology. 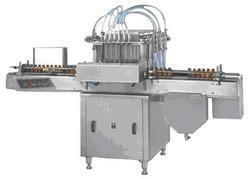 We offer our clients with Automatic Two Head Liquid Filling Machine for Vials at highly competitive prices. These are precision engineered to fulfill various requirements of our clients. We provide customized solutions to our clients for its hassle free functioning. Machine is suitable for Round vials. v Operator required to loading & unloading the bottles manually; wherever filling will be done automatically. Ashirwad Enterprises is one of the celebrated companies of the business, to engage in proffering Automatic Sharbat Filling Machine. Made available in numerous specifications, these efficient systems offer inbuilt protection against over current, voltage fluctuation and short circuit automatic speed control system. Before the final transmission, the entire range is tested for its performance and quality. Filling range 10ml. to 1 Ltr. Bottle Diameter Up to 90mm. Filling range: 10ml. to 1 Ltr. We are the prominent manufacturer, exporter and supplier of Automatic Liquid Filling Machine, these are manufactured from high grade quality material. 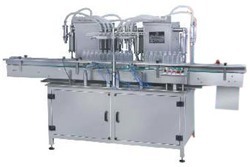 Machine with built-in turn tables at in-feed and out-feed with individual drives to match the speed of incoming and outgoing vials for smoother operation. All parts coming in contact with liquids and rubber stoppers are made from ss 316 materials. These are known for their best quality. No stopper – machine stop system. Synchronized with variable AC frequency drive system. 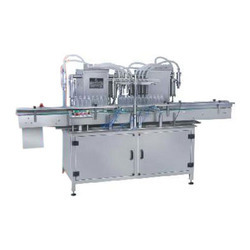 We are one of the eminent names of the business to engage in offering Flavored Milk Filling Machine that is set up with automatic speed control system. Manufactured as per the latest technology, the proposed selection features rigid vibration-free construction for trouble free performance. This efficient machine is acknowledged for its speedy operation and adjustable conveyor height, as per customer choice to align with another line machine.